A friend was having Christmas dinner and at the last minute decided to ask me for a cake. 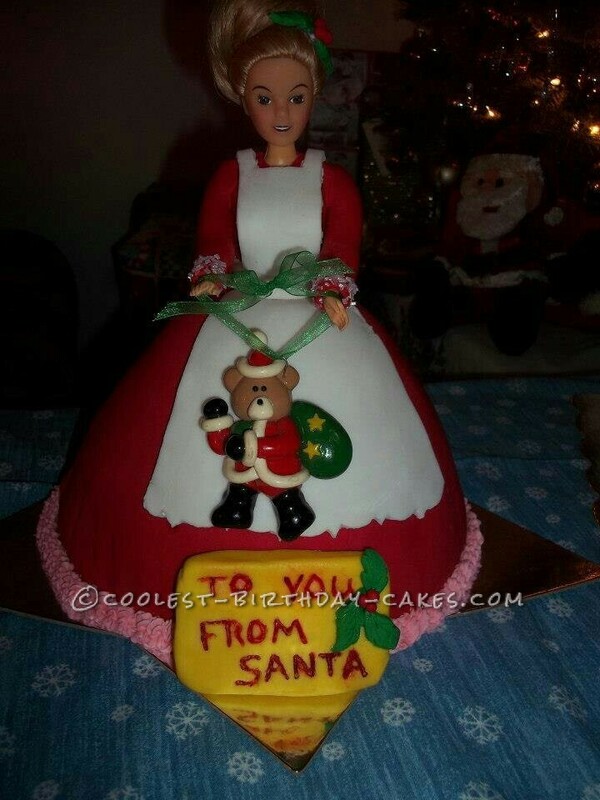 We decided that a Mrs. Santa Claus cake would be perfect. I have made doll cakes but just for my granddaughters. With just a few days, I was able to draw the design and begin baking. I baked 3 2″ round cakes, frosted and semi froze it. I then shaped the skirt from the stacked cake. Using a doll form, I made the bodice, sleeves from red fondant and attached to the doll. I then made the skirt from red fondant placing it over the cake, smoothing so not to leave wrinkles. From white fondant made the apron, free hand shaping the bottom of the apron. I added pink trim to the hem of the dress with edible pearls as centers. I used same pearls for the jewelry. Fondant sign with holly included. I made a dough tree (teddy bear) ornament and hung it from her hands for a memory gift sake. Birthday cake idea Posted by Misty N.